I am Australian. I will wear black until something blacker comes out. Perspex on wood. 2014 (study for larger work). I am Australian. I will wear white until something whiter comes out. Perspex on wood. 2013/14 (study for larger work). I am Australian is based Marcel Duchamp cover design for the Surrealist oriented publication Minotaure No 6, 1934. Minotaure was published between 1933 and 1939. The magazine focused on articles relating to Surrealist principles and theories, architecture and also contained the first published essays of the famed French psychiatrist and philosopher, Jacques Lacan (Vol. 1 & 4). 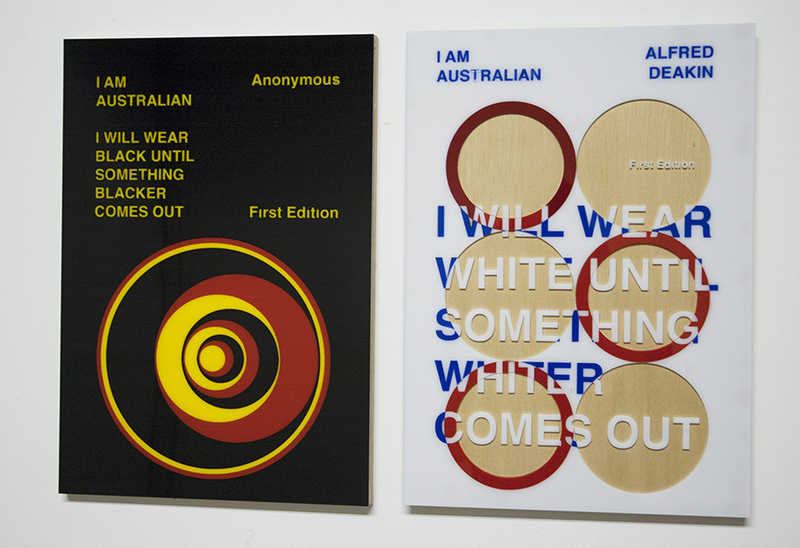 Duchamp cover utilizes modernist principles of simplicity and lent itself to the redesign of the aboriginal flag. Alfred Deakin was Australia’s second prime minister and instrumental in the writing of the White Australia policy.